This article is about the world from New Super Mario Bros. U. For the golf course based on this world in Mario Golf: World Tour, see Layer-Cake Desert (golf course). Layer-Cake Desert is the sandy second world of New Super Mario Bros. U, lying directly north of Acorn Plains, northwest of Sparkling Waters and Soda Jungle and southwest from Frosted Glacier. Unlike the previous desert worlds, which had Egyptian pyramids, it has various desserts within the world, such as giant cakes (with one giant cake in the world map) and giant melting ice cream cones. Part of the name is derived from a type of cake with multiple layers, held together by frosting. The second part is a reference to the similarities between "desert" and "dessert". The boss of this world is Morton Koopa Jr., who was also the boss of Desert Land in Super Mario Bros. 3. There are also giant Moai-like statues called Stone-Eyes in a sea of sand, which also appear in some levels and in the world map. A Super Acorn can also be found in the map alongside the Enemy Courses, where it'll place the Super Acorn in the inventory box. There are 9 levels in this world, with 6 normal levels, a secret level, the Tower level and the Castle level, as well as Goomba and Fire Bro. Enemy Courses, two red Toad Houses and a green Toad House. At the end of Layer-Cake Desert, there's a fork in the road, allowing the player to progress either to Frosted Glacier or Sparkling Waters. Layer-Cake Desert-1 Stone-Eye Zone A desert level with shifting Stone-Eyes. Layer-Cake Desert-2 Perilous Pokey Cave This is a level with Pokeys and shifting sand. Layer-Cake Desert-3 Fire Snake Cavern It is an underground level with Fire Bros. and Fire Snakes, and introduces Glowing Baby Yoshis. Layer-Cake Desert- Stoneslide Tower The Tower of Layer-Cake Desert. The boss is the second round of Boom Boom. Layer-Cake Desert-4 Spike's Spouting Sands A level featuring Spikes and many Flying ? Blocks. Layer-Cake Desert-5 Dry Desert Mushrooms The fifth course of Layer-Cake Desert with many Stone Spikes and mushroom platforms. Layer-Cake Desert-6 Blooming Lakitus A level featuring Lakitus and many Piranha Plants. Layer-Cake Desert- Castle Morton's Compactor Castle The Castle of Layer-Cake Desert with many shifting platforms that can squash Mario. Layer-Cake Desert- Piranha Plants on Ice A secret course filled with Fire Piranha Plants and ice blocks. Layer-Cake Desert-1 Spike's Tumbling Desert A level featuring many Spikes, similarly to Spike's Spouting Sands from New Super Mario Bros. U.
Layer-Cake Desert-2 Underground Grrrols A cave course with many Pokeys and Grrrols. Layer-Cake Desert-3 Piranhas in the Dark A course with moving platforms, Glowing Baby Yoshis, Fire Bros., and Big Piranha Plants. Layer-Cake Desert- Wind-Up Tower The second tower of the game. It features many screws, and the boss is Boom Boom. Layer-Cake Desert-4 The Walls Have Eyes An auto-scrolling stage featuring moving statues that can push the player. Layer-Cake Desert-5 Stone Spike Conveyors A course with Stone Spikes and moving platforms. Layer-Cake Desert-6 Spinning Sandstones A stage with many spinning hills and Stalking Piranha Plants. Layer-Cake Desert- Castle Morton's Lava-Block Castle A Castle with moving blocks that act as bridges to guide the player across the lava. Layer-Cake Desert- Slippery Rope Ladders A course featuring slippery land, ladders, and many Piranha Plants. Layer-Cake Desert in Mario Golf: World Tour. Layer-Cake Desert appears in the Nintendo 3DS game Mario Golf: World Tour as the first course of the Flower Pack downloadable content (the second course being Sparkling Waters). It is a remake of Shy Guy Desert from Mario Golf updated with the style and assets of Layer-Cake Desert. Layer-Cake Desert as it appears in Fruit Scoot Scurry. 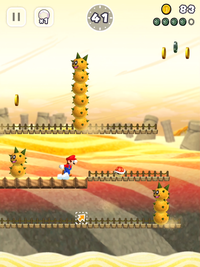 Layer-Cake Desert is featured in Mario Party 10 as the setting of the minigame Fruit Scoot Scurry. The minigame involves players jumping across Stone-Eyes to collect various types of fruit. The levels Big Spiny Blitz, Pokey Vaulting, and Desert Fuzz from Super Mario Run are set within Layer-Cake Desert. Layer-Cake Desert is the third property on the game board in Monopoly Gamer. It is one of two properties in the Light Blue Color Set (along with Stone-Eye Zone). Layer-Cake Desert, Soda Jungle, and Meringue Clouds are the only three worlds to have three Toad Houses, two red and one green. This page was last edited on February 22, 2019, at 03:34.